Rabbi David Lapp was the Director of the Jewish Welfare Board’s (JWB) Jewish Chaplains Council, which endorses Jewish chaplains who serve in the U.S. Armed Forces. 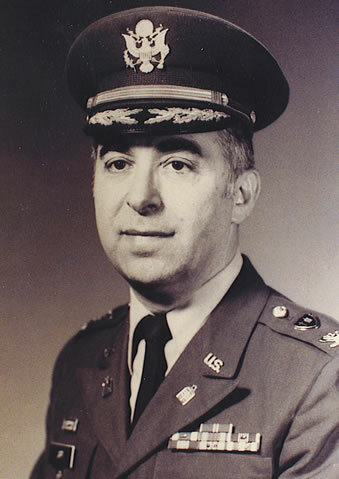 Before serving with JWB (1982-2006), Rabbi Lapp was a Colonel in the U.S. Army (1957-1982). Born in Austria, he talked about his childhood in Vienna, his nearly half a century of service with the U.S. chaplaincy which brought him around the globe, and of his return visit to Vienna in 2000. You lived in Vienna until you emigrated at the age of eight. What childhood memories have you retained of this city? Could you tell us a little about your family and your childhood? My family originally came from Galicia in Western Poland, and my father served in the Austrian army under Kaiser Franz Josef. He was a loyal follower of the Emperor. He settled in Vienna in the 1920s, and I was born there in 1931. One thing I remember well from my childhood is attending Kindergarten in the second district of Vienna where I had a wonderful association with the other children. On Sundays my mother took me to Vienna’s Prater to see the amusement park. Beginning in First Grade I went to a Jewish school in the Malzgasse. I was there for only one year when the school closed. This year was a wonderful experience for me and it was there that my religious background was formed. This school as well as my participation in the boys’ choir of the temple in the Seitenstettengasse made a lasting impression. I used to sing in the boys’ choir in the temple every Friday night for the Sabbath service. This was the choir for the synagogue. That was sixty-six years ago, but Vienna still remains a very important part of me. Although you grew up and were educated mostly in the United States, do you detect any traces of your Austrian origins today? Do you still have any ties with Austria today, such as other Austrian emigrants in the U.S.? Yes, I have some Austrian friends that live here in New York and in New Jersey and we call each other. We occasionally meet and talk and discuss the wonderful things that we have experienced. However, I am one of the younger ones. Those who emigrated in their teens or older, in their twenties, didn’t have the same experiences. My memories are those of a young boy of seven or eight years, and I cannot talk about the suffering or the pain of others. But they remembered that since they were Jewish there was a good chance that they would be attacked on the street by the Hitler Jugend. The only experience I had was after Kristallnacht, when my father was placed in a work camp until we left for America in 1940. Your career brought you around the globe. You served, among other countries, in Germany and Vietnam. Can you tell us more about your years in the chaplaincy? What were the most impressive moments and highlights in your career? In the Army I was commissioned as a Lieutenant and advanced to the grade of Colonel. That is the highest grade for a Jewish chaplain. I had a lot of wonderful experiences in the Army. In America I served at the Air Defense Center in Fort Bliss, Texas, where officers from various NATO countries come to study the air defense- and missile system. In my position as chaplain I was not only responsible for Jewish religious services but for the personnel of Catholic and Protestant faith as well. This is why we are called chaplain rather than rabbi. Serving overseas in Vietnam was an entirely different experience. Because of the pressures and realities of war many soldiers turned to religion. They were all more observant and many began to think there must be a God. This was a very different type of ministry. My primary responsibility was for Jewish personnel, and I traveled throughout a 7,000 square mile area by helicopter in the performance of my duties. During my first assignment in Europe from 1960-1963 I was assigned to Munich, but I also was responsible for Augsburg and Northern Italy. In 1960 Germany was a country that was becoming strong economically and it was becoming a leader again in Europe, and I was a little apprehensive when I was asked to return there. My time in Munich was a very special experience for me. I was also responsible for the stockade (U.S. military prison) in Dachau. I went there frequently to see American soldiers, to advise them, to speak with them and perhaps give them a little bit of the flavor of religion. It was also a special time for me because it was there that I also met my wife. Originally from Israel, she was taking an additional year of nursing in the Schwabinger Krankenhaus in Munich. We were married and had two children, both born in Munich. The second time I came to Germany (1973-1976) I was assigned as a Tank Division Chaplain, a rank which carried a lot of responsibility. It was a very critical time due to the war in Israel, and a lot of our tanks were being sent to Israel to help out. The division I was assigned to was the First Armored Division which is now in Iraq. It was the primary division defending the German border with Czechoslovakia and East Germany against a potential attack by the Russians or other Warsaw pact nations. As a chaplain you worked with a wide range of generations of young men and women serving their country as well as retired military personnel and veterans. Did you experience any changes in attitude towards religion or in the understanding of other religions? Until 1973 the draft was still in effect in America. That meant that anyone over the age of eighteen could be drafted into the army. After 1973, there was an all volunteer army and, of course, the entire picture of those who served in the military changed somewhat. Today the volunteer army is much different and does not have the same mission it had in the 1960s and 1970s. It is much more a liberal army because the people are volunteers. When it comes to the question of religion, I do not think there has been much change compared to the GI that served at that time. Those who come from homes where there is a religious tradition do not lose that tradition when they enlist. Those who do not have a religious tradition rarely acquire it in the military. In 2000 you returned to your native city of Vienna. 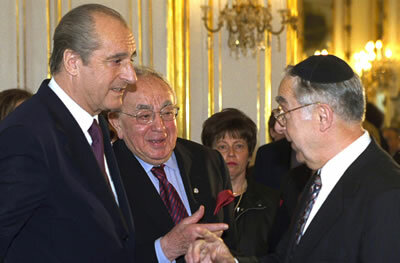 You were invited to come to Austria by the Jewish Welcome Service for a reception by Federal President Thomas Klestil. It was the initiative of Leon Zelman to invite Austrian Jews who fled Austria before and during WW II to visit places they once lived in Austria. This initiative has celebrated twenty-five years of existence last year. What were your impressions when coming to Austria as a guest after so many years? I was very pleased and impressed by that particular invitation, especially to be invited and to come back and to see the Hofburg and all the other places that Dr. Zelman had arranged. The evening service in the Seitenstettengasse-Temple reminded me of the time I was a choir boy in that very temple. Some of the songs by the composer Lavadovsky are still sung after all these years and the temple was one of the few not destroyed during Kristallnacht. When I gave President Klestil a small gift from the chaplaincy I was invited to say a few words. I said, “Who could ever imagine that I, a Jewish boy, would be asked to come back and stand here with the President of Austria? Never.” It was a very moving experience for me. And I still communicate with Dr. Zelman and told him that I have a combat U.S. chaplain field kit that I used in Vietnam and some other things that I would like to give the Jewish Museum. I told Dr. Zelman that I would like to come with my wife and give these things as a momento of my appreciation of what has happened today in Austria. It is not the Austria of 1938/1940, it is a different Austria, at least in my eyes.